The 2nd ASEAN Sports Medicine Conference was held in Kuala Lumpur on the 24th – 25th March. Sports Medicine Australia (SMA) were privileged to contribute to the conference by delivering a plenary lecture and first responder workshops aimed at empowering attendees with practical skills and knowledge for application in a sports setting. SMA CEO Anthony Merrilees, ASMF Fellows’ President Michael Kenihan and ACT/TAS State Manager, Trish Donoghue had the pleasure of presenting these interactive workshops. On day one of the conference, Michael Kenihan delivered a plenary address providing background to SMA as an organisation and in particular, the Safer Sport Program (SSP) which has grown from strength to strength since its establishment over 35 years ago. Later on in the day, Trish Donoghue collaborated with Professor Ernest Yeoh in outlining a range of preventative methods and interventions to utilise as first responders. This session also focused on injury management including identifying and treating injuries, as well as recovery. The second and final day of the conference saw Trish Donogue and Anthony Merrilees provide an introduction to head and spinal injuries. This session was interactive; aimed at giving attendees practical skills to apply within their respective sports. This included practical demonstrations on how to transport an injured player, immediate on-field management for suspected spinal injuries and how to support an athlete until further medical support arrives. 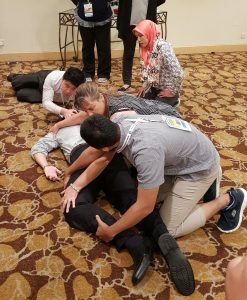 With many ASEAN countries looking at establishing programs similar to SMA’s successful Safer Sport Program, these workshops will hopefully empower first responders abroad and sports medicine decision-makers in implementing their own programs, while helping to make sport safer for all.